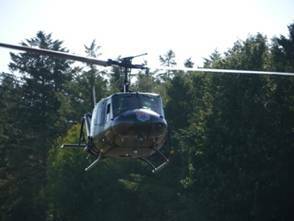 The Huey Display Team returned to the East Fortune Airshow at the National Museum of Flight for the third year running, but for the second appearance with Huey 509. It had been a busy week for Rob and Phil who had returned to Wesham with Huey from RNAS Culdrose on the Thursday before taking to the skies the next day to fly north to Scotland. Rob was to fly the Huey and Phil was driving the motor home so that they had accommodation and so the Huey shop could be set up on the Saturday. Phil hit the road at lunchtime with the Huey lifting later that afternoon. The weather could have been better but everyone arrived ok and it did give a great photo opportunity. The rest of the team - Jo, Nina and I - set off from Wesham Saturday morning at 6 am (yep.... 6 am!). 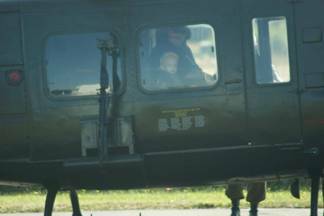 The reason for the early start was that we had an important appointment to keep up at East Fortune as the Huey team were going to surprise a very special guest. I’ll let Phil take up the story from here…….. The week before the Airshow we were contacted by Linda De Costa, Administrator at the National Museum of Flight and part of the Team there organising the Air Show, who explained she knew a local boy, David Watson, who has been very poorly but is “daft about aircraft” and determined to attend the Airshow and wondered if Phil would like to meet this brave wee fella! David is quite a regular at the National Museum of Flight attending most of their Shows with Amanda Stenhouse and the Bouncy Castle Team. David is the son of David and Shirley Watson, a local family in Haddington and he is currently undergoing chemotherapy treatment for neuroblastoma (cancerous tumours) at The Royal Hospital for Sick Children in Edinburgh. He was diagnosed when he was three, had treatment and the all clear but now another tumour has been discovered. He is currently receiving ongoing chemotherapy treatment spending his time between hospital and home. As well as looking after David, his wonderfully supportive family have been charity fund raising for the ‘Sick Kids Foundation’ connected to the hospital in Edinburgh for the past year. 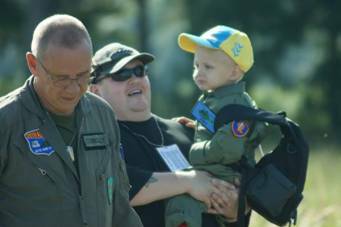 David was at the Airshow with his dad, also called David Watson, when Phil went across to introduce himself. 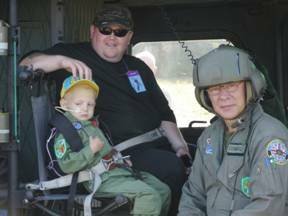 David then came across with his dad to meet the crew, sit in the helicopter and be their special guest and Honorary Flight Crew Member. David Jnr was an excellent Crew Member and it was good to have them on board. He went home shortly after his visit over with the helicopter then back into hospital for further treatment and apparently was talking about his day and the helicopter all the way. A very courageous little boy and family and we hope to see them again soon when they come over to the North West for a visit to Blackpool. Big thanks to Norm Webster (RAFCTE), Linda De Costa, Steve McLean and all at the NMoF. Also to our Honorary Crew Member, David Watson, and his family and friends. which is David Watson’s fund raising page for the ‘Sick Kids Foundation‘ OR http://www.edinburghsickkids.org/ and give them your support. Thanks. 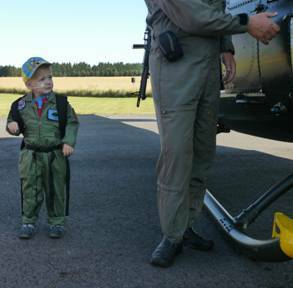 After meeting David and his father, Rob needed to ready the Huey for their part in the Flying Display. We sorted the shop out then whilst Jo and Nina manned the stall, Phil and I headed down to the flight line to talk to the public and to give out our ‘Huey’ stickers to anyone we could stick them on. 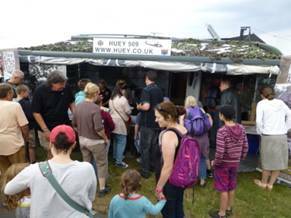 The crowd at the show are just so friendly and polite; it was a delight to be there and meet them and to talk the hind legs off a donkey about Huey 509. The shop did a very brisk trade which all goes to help keep 509 flying. [Thank you].The Air Display started with a thunderous appearance by the BAE Systems Eurofighter Typhoon. It is always impressive to see this aircraft dance around the sky. There were great displays from a variety of aircraft before it was the turn of Rob to lift into the East Lothian sky to beat it into submission with 509. He put her through her paces while Phil joined Ben Dunnell in the commentary box to talk about the history of this iconic helicopter. Also playing on the tannoy, during the later end of the display, was The Doors’ song ‘The end’. No sooner had the day started it was coming to an end. After the last display, we readied Huey 509 for the return flight to Wesham. 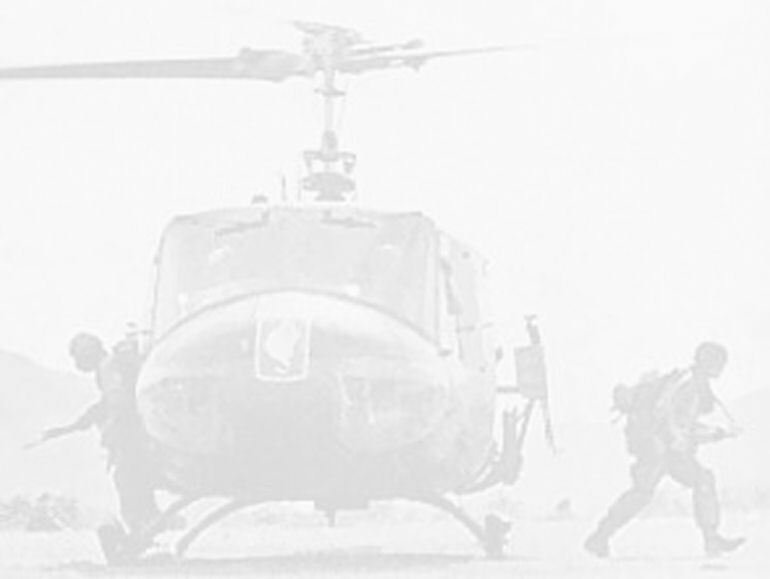 Much to the delight of the huge crowd they got to see and hear the Huey for, in some cases, the third time in a day. 509 safely away the rest up us packed up the shop stock and took down the awning. We set off by early evening and rolled in to Wesham a little after midnight. It had been a long and tiring day but it has to be said, one of the most memorable, enjoyable and extremely humbling shows we have done to date.